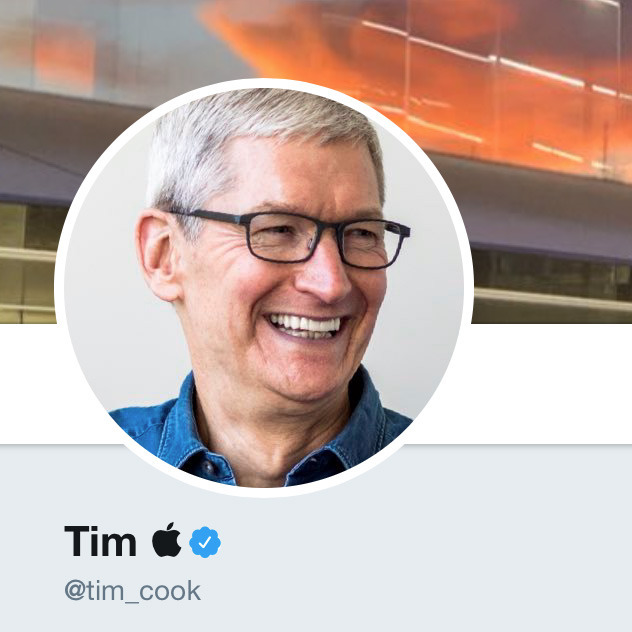 Cook's Twitter profile now names him as "Tim Apple," the last name being represented by an Apple logo on compatible devices. The rest of his profile and feed is otherwise unchanged, making no references to Trump's comments. The CEO was in Washington, D.C. yesterday as a member of the White House's American Workforce Policy Advisory Board, sitting directly next to Trump. Trump is known for both deliberately and accidentally changing the names of famous people. He once called Lockheed Martin CEO Marillyn Hewson "Marillyn Lockheed," and has referred to Amazon CEO Jeff Bezos as "Jeff Bozo," mainly because his newspaper the Washington Post has regularly covered the White House in a manner that the president does not prefer. In Wednesday's meeting Trump said he considered Cook "a friend," if largely because of Apple's hiring sprees and cash repatriation. It's questionable whether the two have a genuine friendship — the CEO has regularly spoken out against Trump's policies on matters like immigration, LGBT rights, climate change, and Chinese trade. Apple has at least benefited from lowered corporate taxes.